Sometimes I do it "3" or more times in a roll............ Look at that impressive hip action!! Mom has no idea why I do it since I have NEVER EVER tried to hump a dog or a person in my life. It all started out with mom's......."pillow"...........for some reason, I fell in luuuv with her pillow. However, mom was not very happy about having her pillow humped 3-4 times a day, so she thought maybe if she got me big stuffies, I would hump them instead of her pillow. It worked!! 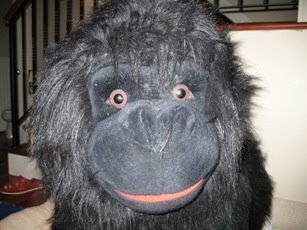 I acquired Mr. Gorilla and Mr. 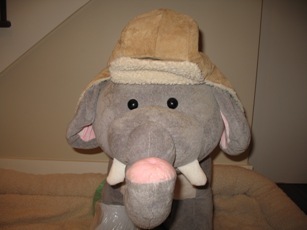 Elephant on my 4th & 5th Birthdays. Sunshade - I'm in awe. Your mom is so nice to provide you with all those animal friends to assist you with your "loving". My mom had to cover her eyes while I was watching your videos. Wow - I thought you were a girl! I don't even do that! Except 2 times in all these years - it got cold here in the subtropics - cold enough for Daddy to put on his sweatpants. I did that to his leg both times he wore them! ok, mom told me what happened though she forbid me from watching the video. anyhow, she said she now know what to get me when i'm in "loving" mood next time. Ewwww!!!!! That's nasty! If my human sees this you will activate the paterntal filter and not let me visit blogs anymore. Maybe the vet could give you medication for your problem and you could get some help? A 12 step program, perhaps? 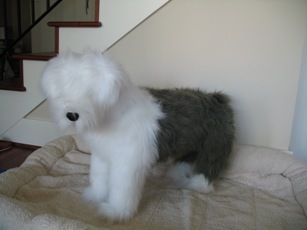 What exactly are you doing with your stuffed animals? I am only 2 and a half and have never seen that before in my life! Sometimes male dogs try to do that to me but,I am a proper lady so I give them a swat and upper paw to the jaw. Besides, I have a boyfriend....T-Man who also signed your blog so don't get any ideas Romeo! Hilarious! 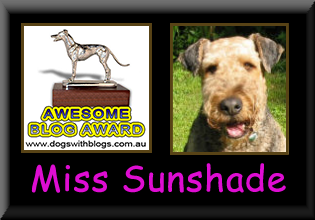 Ms. Sunshade, you made Dog Blog of the month on www.wikiFido.com! You should add a link to wikiFido so others can see you're the top blog!